Would you try out this trend? Finding new ways to use makeup (other than what they’re originally intended for) is a great money-saving strategy. Mascara as liquid liner, lipstick as blush—been there, done that. This makeup trend, however, might come as a surprise to you. 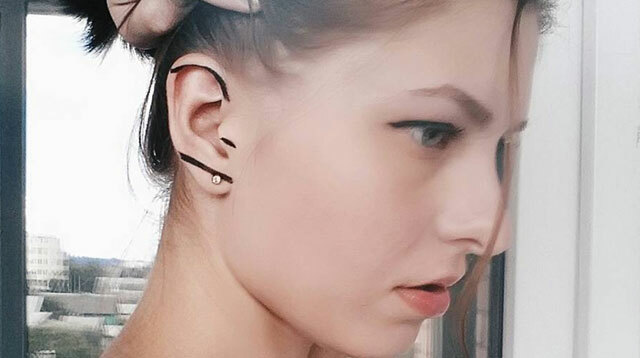 It debuted on the Louis Vuitton Spring/Summer 2016 runway show in October 2015, and now, one year later, ear makeup is officially a thing. Makeup enthusiasts are dipping a toe (er, ear) on the trend and posting the results online, and they actually look very pretty! This woman patterned her entire look after that from the Vuitton runway, pairing silver-dusted ears with drawn-on exaggerated lashes. We also love this shimmery style accented with a few tiny dots—repurpose those highlighters, CGs! How about keeping the color just on your lobes? Gold liquid shadow and delicate earrings look amazing together. You can also make a statement with an intense blacked-out lobe, as seen at Anthony Vaccarello. Or get graphic with a few strategically placed lines. You know what to experiment with next!